Going back to all the photos I wanted to post and comment on but never had the chance to until now. If you're bored with this trip, skip this and a few more upcoming. This is a review of Thursday, November 5th. It was a sparkling morning. Because of the lingering drought, this is usually how mornings start, I'm given to understand. For a Midwesterner who does not anticipate this kind of sunshine in November, when it can be more cloudy than sunny, it was exciting. Liz and I walked the equivalent of 6 blocks north to the park. We got there, on purpose, with time to spare, to have a quick breakfast and then to wait. 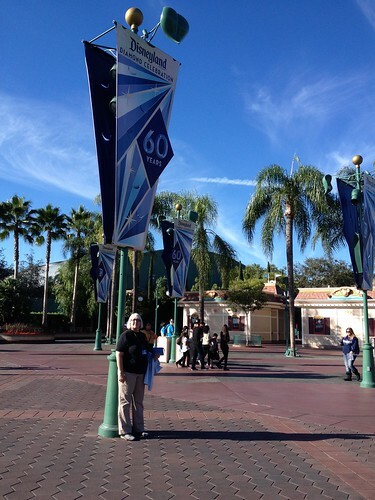 It really didn't seem real until we went through security and into this plaza where all the light posts were festooned with the celebratory 60th Anniversary banners. Oh that's right! 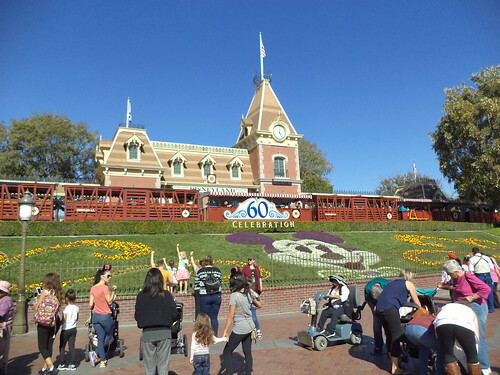 Disneyland is celebrating its 60th year in operation. Liz had mentioned this and said there would be all sorts of fun stuff going on. It did not hit me until I was standing in that square and there were these banners. Liz handed me my ticket. Wow. She was ever so patient and amused at my slack-jawed yokel-ness amazement at where I was. When we decided to do this and I made the decision to pay for 2 days of Disney, it was a long ways off. Liz, the admitted Disney "freak", kept getting more and more excited to show us the parks she loves. It was exciting, but, jeeze, I need a new washer and then the car dies and any celebration is simply that I can pay all my bills at the end of the month. 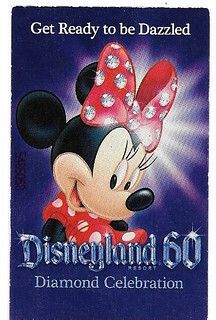 But then, she hands me this small piece of paper and I walk into the plaza between Disneyland and California Adventure and, my mouth drops open. I really am here. I was given the option of going to California Adventure or Disneyland first. I thought about it and decided on California Adventure as Disneyland would be quasi-familiar due to my visits to Walt Disney World. I handed the pass to the gentleman at the gate. "Welcome Princess," he said. I laughed and said, "No one has ever called me a princess. I should get that in writing." He pulled out his marker and wrote on the back of my pass. There. 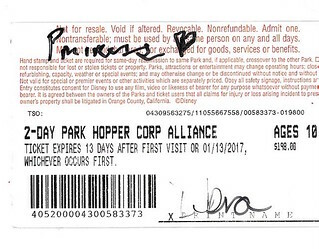 "Proof", such as it is, that I am a 'princess'. Yeah, tell that to the cats. We headed into the park. 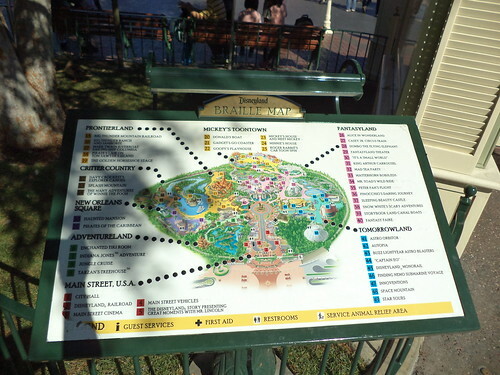 Of course, I had to take a photo of the map. It is quite easy to get completely turned around. That is probably by design. The longer you are in the park, the more chance the souvenir shops can part you from your money. North is at the bottom of the map. The ferris wheel, which I've already blogged about, is at the top of the map. Part of my job is to know which way I am facing when I discuss what I see on a building's walls. I abandoned my kind of meager sense of direction and just surrendered to the fun. This is supposed to be part of "the happiest place on earth". I should enjoy the sensation. We walked about the park. Around every bend are the unusual and photogenic. 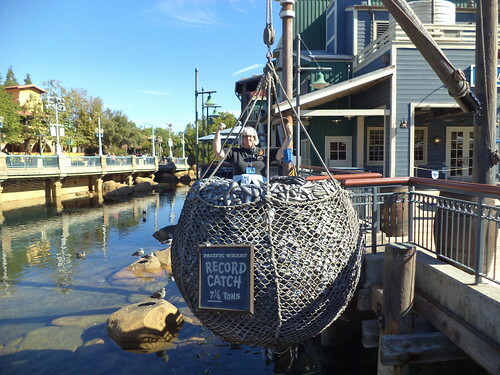 Disney, of course, plans for this, although there aren't a lot of the obtrusive "Kodak Photo Spot" signs I remember from Disney World. This is hilarious. 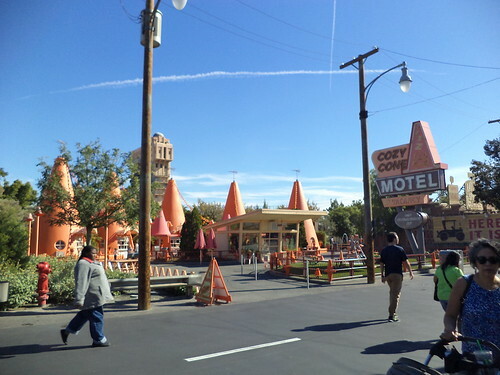 All the eateries are in cone-shaped buildings in Cars Land. The obligatory humorous photo conveniently provided by the park and, of course, you have to do it. Oh my gosh! Real birds! You don't expect to see those. You kind of think, because Disney is a leader in animatronics, that any animals you see are going to be of the mechanical kind. 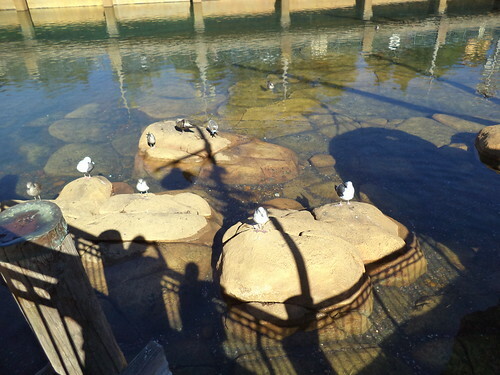 I had to take a photo of real, live, seagulls. Here's another spot where there were real birds. 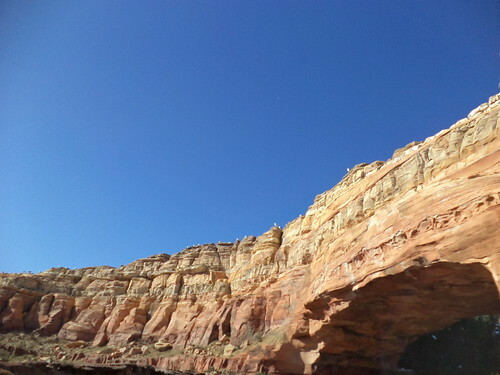 These are the fake mountains in Cars Land, in the ride area. It's hard to see in the small photo, but there are seagulls perched on the top of this hill. I thought, "Gee, they do think of everything" when I saw it and then a couple of them flew off. We didn't see many birds or chipmunks or squirrels in the park, in spite of the huge amount of food around. Even though there is an army of people with brooms and small waste cans, food is everywhere. Yet, those scavengers I'm so used to at other large venues where nowhere to be seen. I wonder how much of that is due to the diligence of park personnel in keeping the place clean and how much is due to the presence of feral cats. If you didn't know about the feral cats making their homes in Disneyland, here's the link to an article about them. I have noticed an uptick in wildlife in my backyard now that I don't have outdoor cats roaming about the yard. At noon, we went across the plaza to Disneyland. Of course, this is the first thing you see when you walk in. I didn't get to ride the train. Guess I'll have to come back. So I wonder if this is the most photographed human sculpture in the world. That's Sleeping Beauty's castle in the background. Cinderella's castle is at Disney World. This one isn't as high and it's a different coloration. Lots of people were trying to get just the right photo of the statue with the castle in the background. Everyone was respectful and waited their turn, even offering to take photos with other people's cameras so they could be in the photo. We didn't hang around much because we were coming back for an extended period on Sunday. Disneyland feels more like a park should. You're entering from the south and working north instead of the other way around. 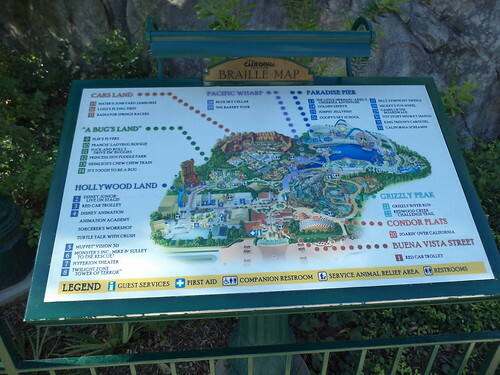 I don't know if situating your amusement park along cardinal directions has anything to do with attendance, but Disneyland felt more comfortable. That could also be the problem of California Adventure trying to figure out what it is. It's always been something of a step-child to Disneyland. There aren't as many rides and it's more heavily shop-based than Disneyland. It's supposed to be a Disney-fied version of the Anaheim Walt came to in 1920. 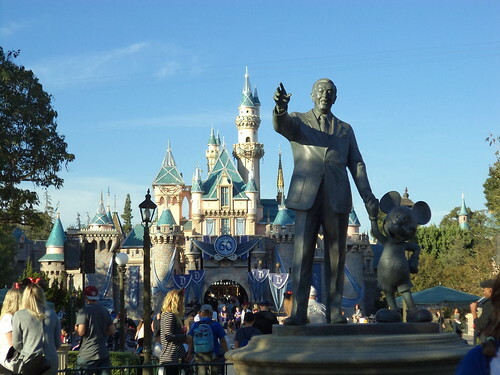 It's fun, but if you're a tourist, you gravitate to Disneyland. That's only natural. 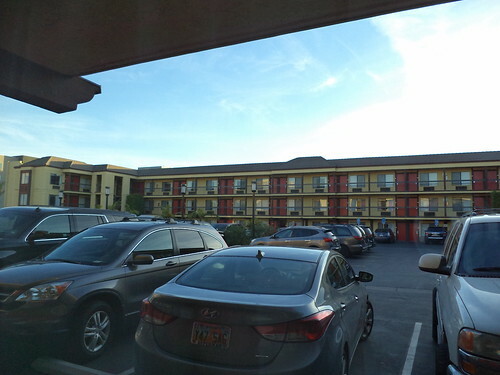 We left at 3:30 and walked back to the hotel. I had a blister on my right foot; on the ball of the foot below the middle toe. It made walking painful. We met up with Ashley, who had arrived at 3, and headed over to the Convention Center. Again, I felt that awe at being in a place I'd spent 6 months preparing for. There were people everywhere, although no one in costume, yet. We walked in and got in line for our convention badges. The line moved swiftly and I think we had everything in 15 minutes. There is no merit to showing up early. 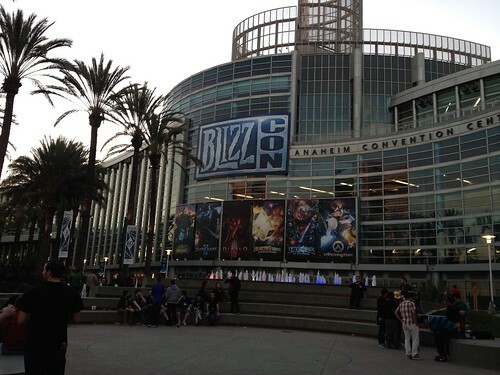 You can't do anything other than stand in line for hours to buy things from the Blizzard store. Ashley and I went to the store on Saturday morning and spent 30 minutes total, making purchases. If I ever do this again, that's when I'm going, first thing on a Saturday morning. From here, there was a "party" in the Hilton which wasn't real spectacular. There was an art exhibit and, later, meet and greets with people from WOW-themed web sites. But we weren't really interested in them so we met up with Amy and her hubby and went to dinner. Friday would be the big day. Most people I know go to Florida. "The Wonderful World of Disney". Not to mention I don't see many pics of Disneyland.